It is the most distinctive peak in the world, thanks to its dramatic pyramidal shape. 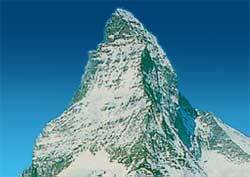 The Matterhorn peak was finally scaled in 1865, but at a cost of four lives. Today, the mountain is easier and safer to climb, thanks to permanently embedded pitons. Thousands of climbers challenge the Matterhorn each year and many make it to the top. Still, tragically, deaths continue to occur. Most people come not to climb the Matterhorn but to see and photograph it in the summer months. The cold months bring the skiers, especially those who relish the lively international après-ski life in the nearby picturesque village of Zermatt. The Matterhorn is shared by Italy and Switzerland. However, it’s the Swiss side that has the famous face (see photo) and wins the Hillman medal. The summit towers 4,478 meters (14,692 feet) high.